Make your daily shave more special with a wooden razor handle and stand set that’s handcrafted in the USA and guaranteed to last a lifetime. 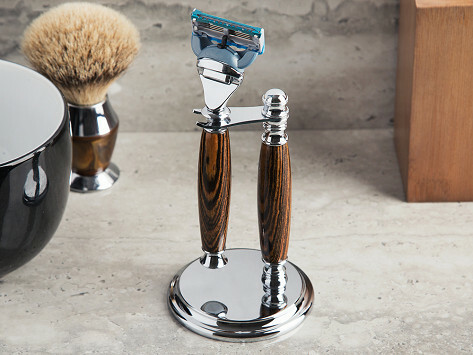 The handle works with most popular razors, and it and the stand are made from sustainably grown and harvested wood and finished with chrome accents. It's a striking and useful set you’ll be happy to have on display. I have a single blade, beaver brush and soap dish that match this perfectly. This is a great addition to my classic shaving routine. An absolute must! Classy beyond words!! Just exactly what I was looking for. Great craftsmanship.